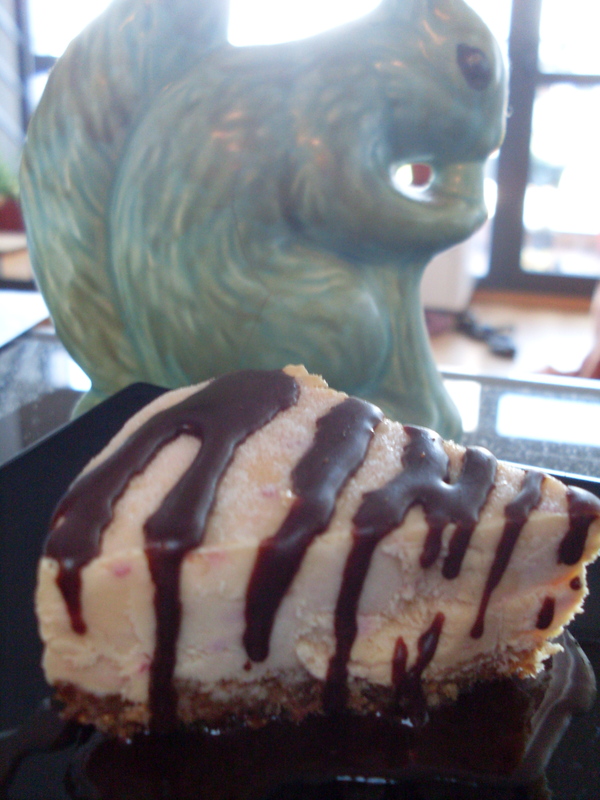 After my mid-afternoon nap, I woke up craving something sweet. I knew that I wanted to make something a little bit different, and thought of the poor, overpriced matcha in my cupboard that has been languishing unloved for weeks. I then turned to the huge basket of passionfruit that came in my vegbox this week and thought “Hmmm. That flavor combination just might work!” And it does! As per usual in my household, I made half of the recipe sugar-free for my hubby. 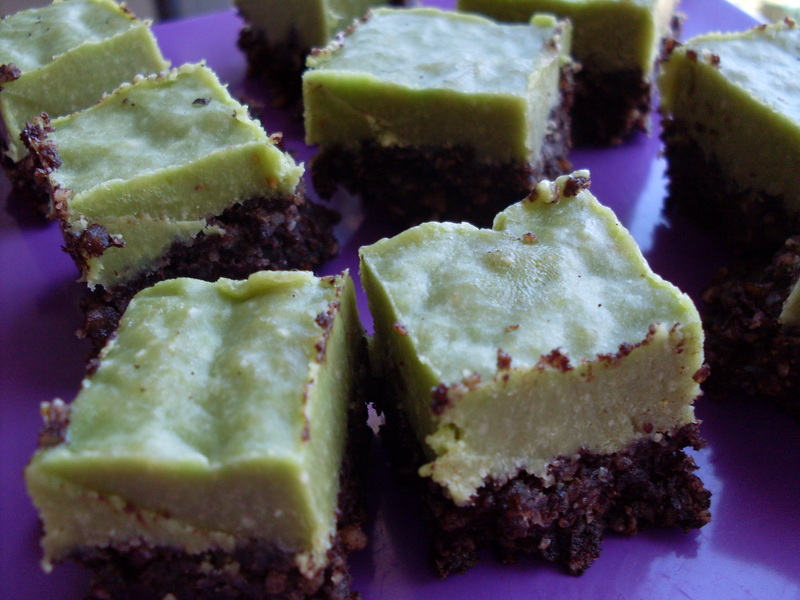 In food processor, blend all ingredients until matcha is well incorporated. In silicone cupcake holders, fill ¾ full and poke a hole in the center of each one, and fill hole with the passionfruit pulp. Cover with remaining cupcake mixture and pat down. Set in freezer while making icing. In high speed blender, blend all ingredients until smooth. Pipe or spoon icing on top of cupcakes and leave in freezer to set for a further 20 minutes. En un robot de cocina, procesar todos los ingredientes hasta que quede una masa con el té verde matcha bien incorporada. En unas formas de cupcake de silicona, rellenar ¾ del recipiente y con un dedo, formar un agujero. En ese agujero, rellenarlo con la pulpa de maracuya y desupúes tapar con lo que queda de la masa. Presionar bien. Colocar en el congelador mientras que haces el glaseado. En una batidora de alta potencia, batir todos los ingredientes hasta que quede una crema suave. Poner encima de los cupcakes y volver a ponerlos en el congelador durante 20 minutos más. I think maybe it was having such intimate contact with the Earth yesterday, but I woke up this morning feeling super groggy. I didn’t really want to have coffee, so I made this drink that I also had on Saturday afternoon when I felt my energy flagging a bit. I don’t want to call it a coffee substitute, as it is what it is in its own right, but it does share a similar flavor profile. Whatever you want to think of it as, give it a try when you need a pick-me-up! Blend it up and enjoy! Serves 2. I wouldn’t say that I am one of those people obsessed with superfoods, making elixirs that end up costing something outrageous like 20 dollars per blenderful. But on the other hand, I do think that they have their place in a conscious diet. Another objection that people generally have to superfoods, and one that I understand and struggle with myself is the whole local foods being ideal vs. superfoods being sourced from across the globe. Again, I think it is always best to balance idealism with a balance of pragmatism. Absolutely, each geographic area on this planet has it’s own indigenous superfoods and it is not explicitly necessary to eat suma from Brazil, ashwaganda from India, goji berries from China, mesquite from Arizona and chaga from Russia if a person lives in Western Europe, for example. 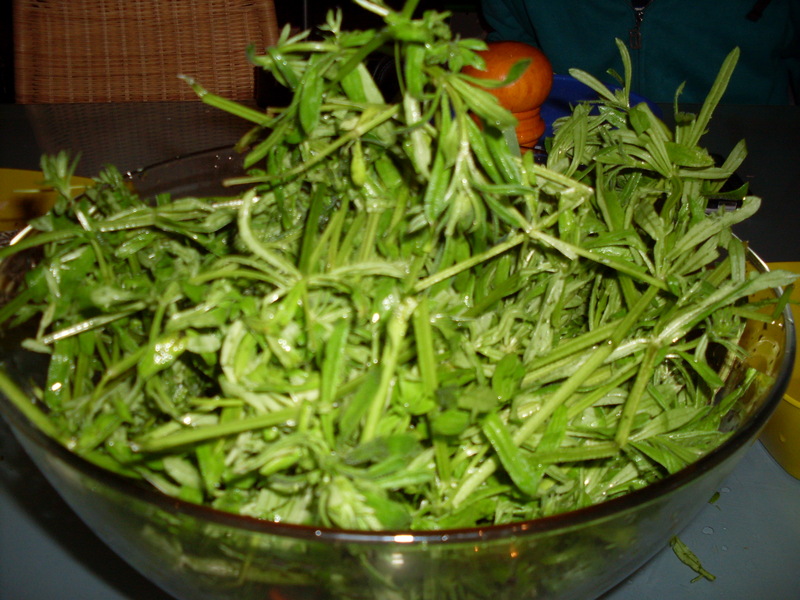 Living in Spain, there is an ABUNDANCE of wild edibles and herbals, which to me should be considered superfoods. My husband and I routinely collect nettles, purslane, chicory, rosemary, lavender, pine pollen and more, depending on the season of course! On the flip side of that, we DO live in a global society, however much we may dislike that fact. That does have it’s advantages. I absolutely adore the flavors of Thai food, and some of those ingredients are simply not local to me. Does that mean that I shouldn’t enjoy it? Of course not! I think the same is true for superfoods, when they are sourced as ethically and sustainably as possible. I truly believe that the world IS facing some massive structural changes, and that we will in our lifetimes undergo radical changes to our lifestyle, necessarily resulting in a return to more local economies. But for the moment, I think that we have been given a special gift in that we are able to pick and choose the most nutrient-dense and delicious foods from all over the globe. Anyway, my point in all of this (after much rambling!) is simply that recently, I have had an intense craving for the very first superfoods that I was introduced to years ago, but which have fallen into disuse in my kitchen- goji berries and maca. Maybe it has something to do with my body craving specific nutrients, or maybe not, but all I know is that I HAD to have them! These balls are not especially sweet, so if you have a massive sweet tooth or are accustomed to sugary foods, then I would suggest adding in 2 tbsp. local honey or agave syrup. 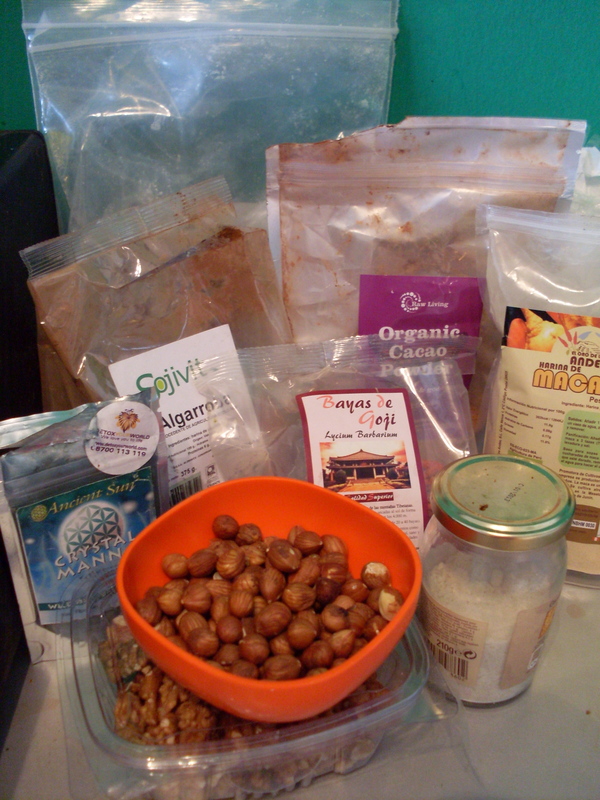 Process nuts and dried fruit, then add everything else minus the cacao butter to the food processor and process again until fully incorporated. It will still be quite crumbly. Add cacao butter and process once more. 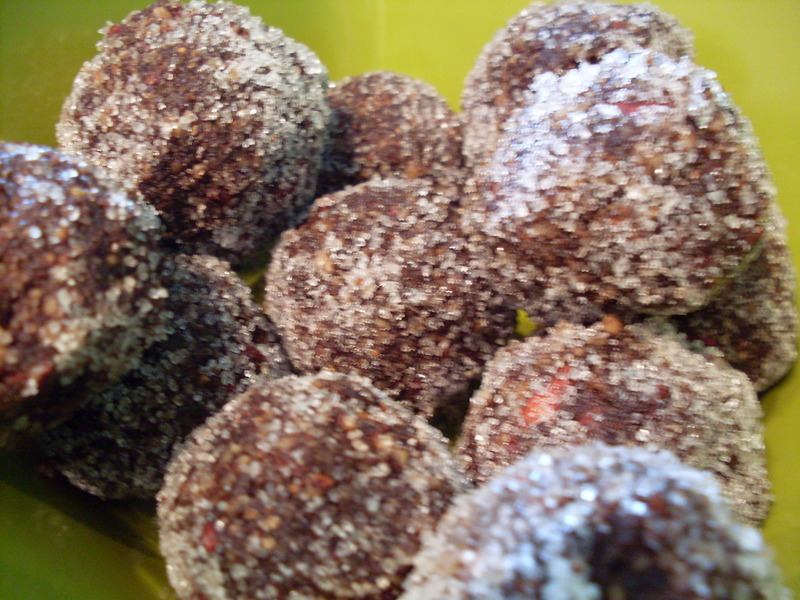 Roll into balls with your hands, and then roll in xylitol to finish. Mush everything together in a bowl and enjoy! Hi there! I hope you have had a wonderful weekend. Mine has been super busy, but also extremely rewarding! As I mentioned in my last post, I gave my first raw foods workshop. It was really nice to do, but also so, so tiring. I think that more than anything that has to do with the fact that I am 8 1/2 months pregnant, LOL! I think sometimes that I truly must be crazy to take on projects like this right now, but it all turned out well in the end and I am looking forward to doing more- hopefully each time, it will get a little more polished and professional and each time I will get more interest and more people involved. Today, I have been resting, taking it easy and sipping on iced green tea/nettle blend with lime juice. 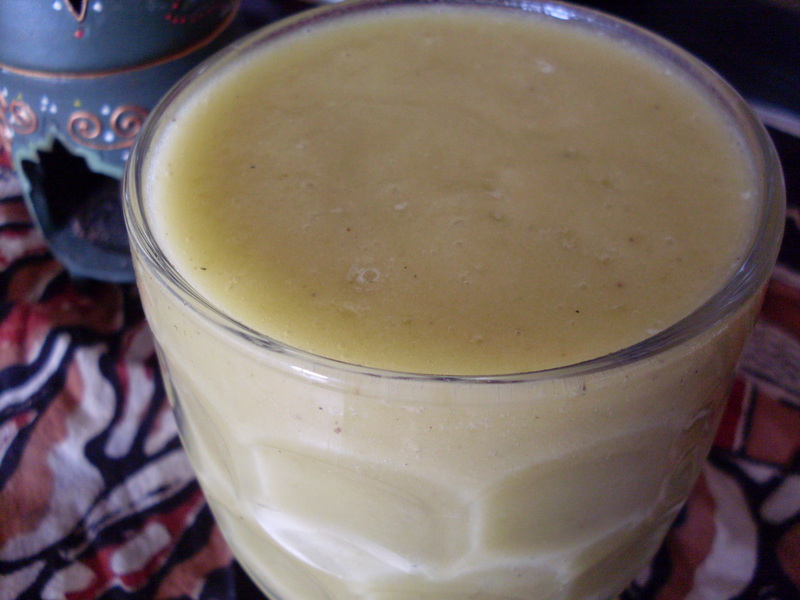 So delicious, refreshing and gives me a little energy without burning out my adrenals like coffee does. This has been my go-to breakfast most days- super simple Banana Soft-Serve. With the heat here, I just can’t get enough cold things, it seemed. 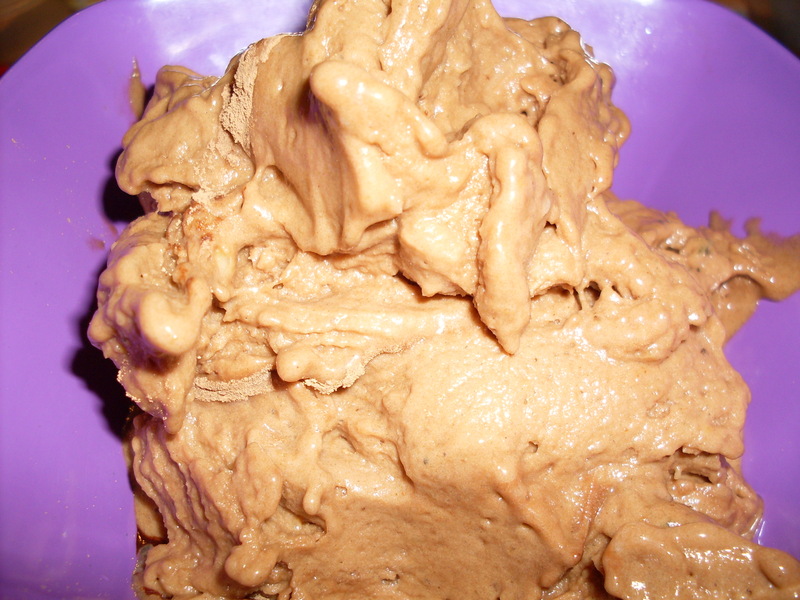 This particular day, my ice cream brekkie had 3 frozen bananas, 2 tablespoons hemp protein powder, 2 T. raw cacao powder, 1 T. Greener Grasses powder and 1 t. crystal manna powder. Seriously, who needs that dairy crap when you can have this?? Next, in order to take advantage of the summer fruit bounty, I have been making fruit sorbets *a lot* Sometimes, even twice a day! This one had frozen strawberries blended with fresh nectarines and a tiny bit of vanilla stevia. I am LOVING the organic fruit we are getting now!! Lastly, this is a nectarine cheesecake that I made last week and have been slowly munching my way through. Hard work, I tell you! I basically adapted the recipe from Heather Pace’s mango cheesecake recipe. Add all ingredients to a food processor, and process until mixture is crumbly but sticks together. Press into 7 inch springform pan. In a blender, add all ingredients except for coconut oil and blend until smooth and creamy. Add coconut oil, and blend again. Pour over base and place in freezer for half an hour or the fridge for 2 hours in order to set. I topped this off with a quick chocolate sauce to make it extra lush! Mix all ingredients together and pour into squeezy bottle. Now you can squeeze magic chocolate sauce to your hearts content. Enjoy! Serves about 7 people. 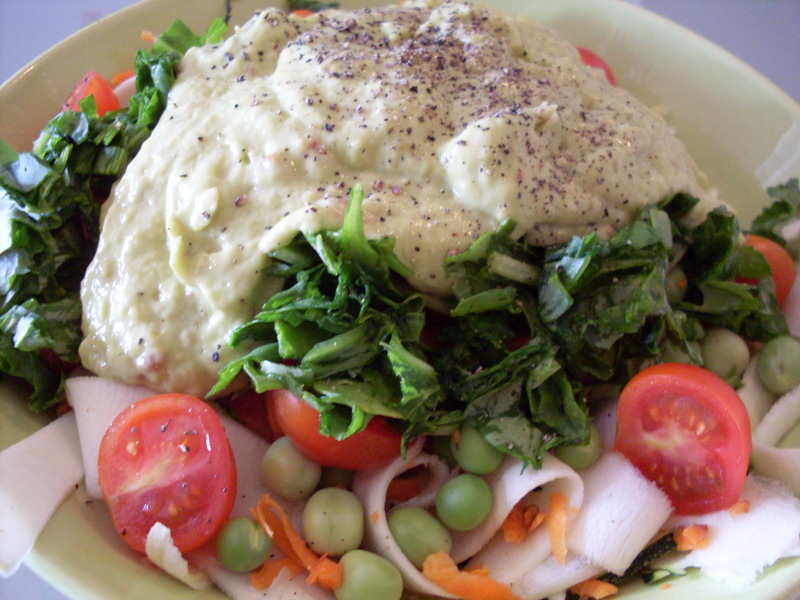 Lest you think all I eat is sweet foods, today I have had a BIG salad with watercress, romaine lettuce, grated carrot, cucumber, radish and apple, with a tahini lime sauce and sprinkled with a few cashews and hemp seeds. 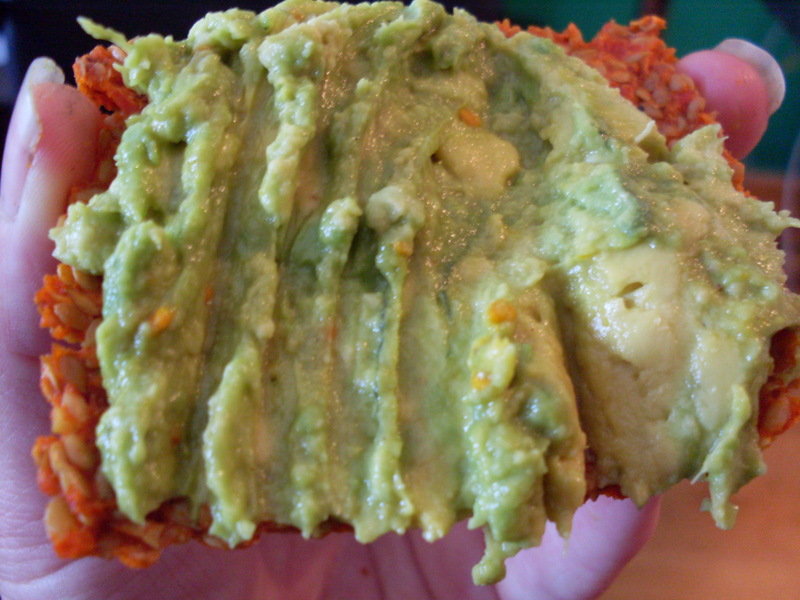 I also had a few bits of spelt bread with mashed avocado, apple cider vinegar and ground black pepper. 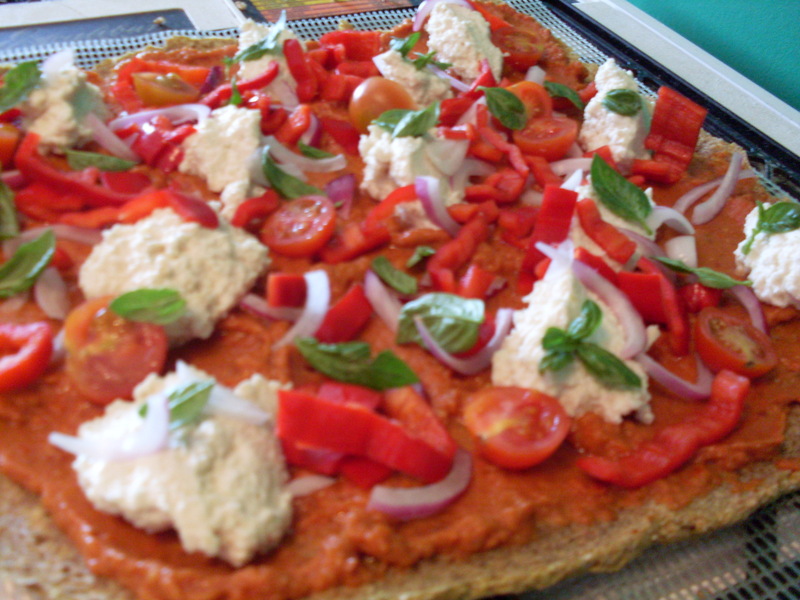 Tonight, I am making a quick raw pizza with some bases left over from the last time I made it, and a sundried tomato and basil pesto that I will share tomorrow. I’m going to leave you with a picture of myself, taken today at 34 weeks. I think that I have gained a little more weight this pregnancy than what I would have ideally liked to do, but the important thing is that I feel healthy and happy and that the tummy creature is doing well. Here is looking forward to an awesome week! 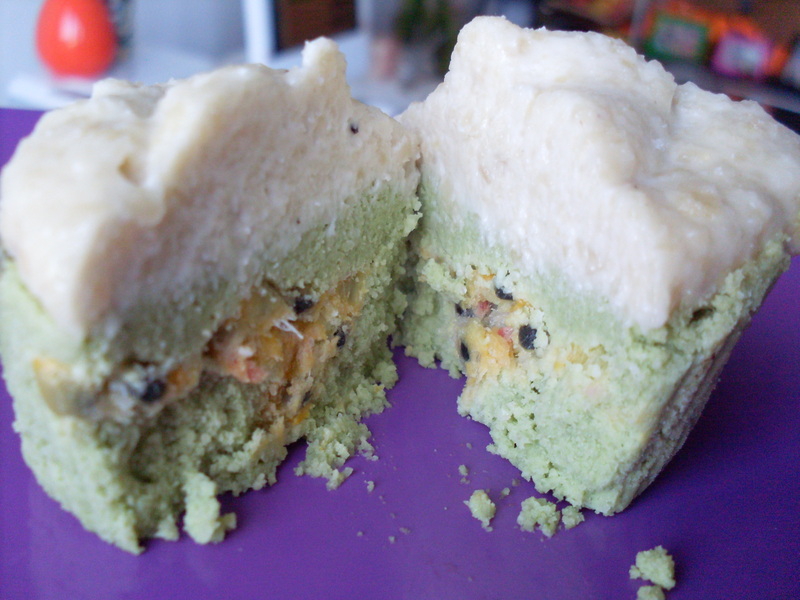 As I mentioned the other day, I bought some matcha powder to play around with. I don’t know if it is some sort of weird pregnancy craving or what, but I HAD to have matcha! I’ve been dreaming about it for months but just couldn’t seem to get my paws on any of it. Well, I went into the city to have my third trimester blood test, and on my way back to the metro, I saw a tea shop. I thought to myself- maybe? I went in, and lo and behold there it was. And organic to boot. Also, the woman working was so, so nice. She kept giving me glasses of iced vanilla rooibos and a spicy chai tea that was delicious. It was such a change of pace from the usual level of customer service experienced here in Madrid, i.e. non-existent! 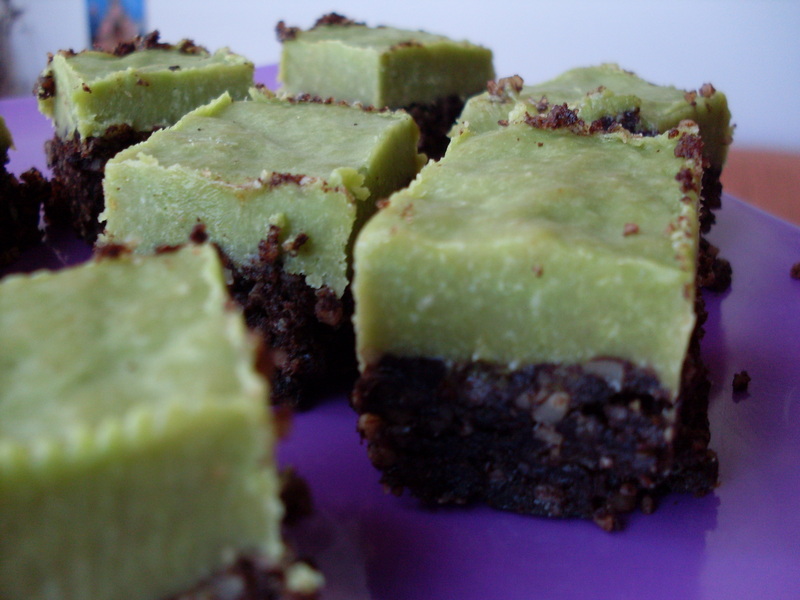 When I got home, I thought about making some brownie bites and then rolling them in the matcha powder. Nah, too easy peasy. I wanted something a little more spectacular and that more importantly would eat into the kilo of coconut oil I have. Alas, these babies were born! 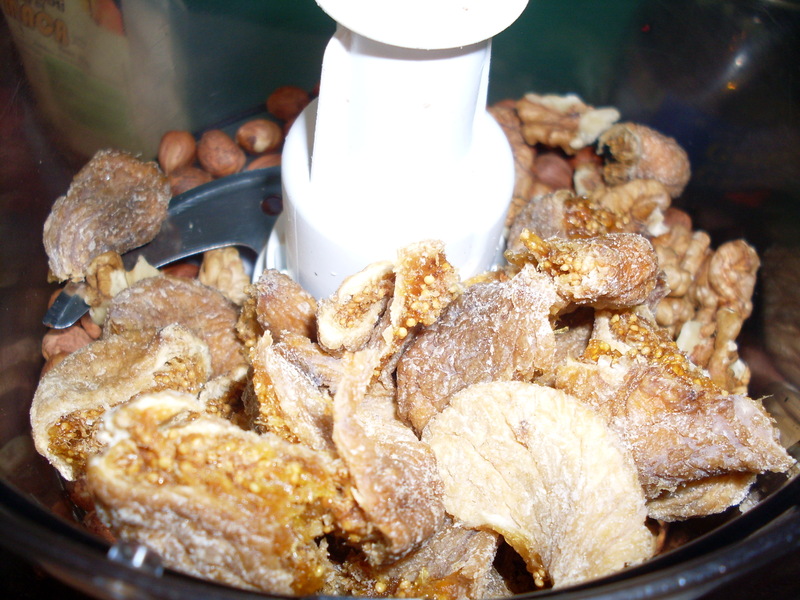 Process walnuts until crumbly and add all other ingredients to food processor. Process until well combined and sticky. Add 2-3 tablespoons water if necessary. Press dough into a round spring-form pan and set aside while you make the topping. Makes about 25 small but dense squares. That’s it! Now I am off to make a big fat green juice and some salt and vinegar kale chips! Have a great Sunday afternoon. Recent Savory Eats and News! I have officially finished my career as an English Teacher! It still doesn’t feel real, as I have spent the last six years working at the same academy. It is something that is so familiar to me that it hasn’t fully sunk in yet. I know that my next job, that of being a mama to the beautiful creature I am carrying in my belly, is the most important job I will ever have. Then, after that, who knows? I feel strangely liberated by the uncertainty, like the world is my oyster, so to speak. I do love to teach however, so maybe yoga? Maybe raw foods? Whatever my next incarnation will be, I am patient now, waiting for what feels right. This is a meal I made for lunch the other day- super simple and delicious! It was some zucchini noodles made with a veggie peeler, cherry tomatoes, grated carrots, fresh peas, and spinach. I topped it with a simple sauce made from the inside bits of the zucchini I didn’t use for the noodles blended with an avocado, lemon juice, a bit of himalayan salt and some hemp seeds. And a generous sprinkling of ground black pepper of course! I also broke out of my rut and made a raw pizza for the first time in months! It had been entirely too long, as raw pizza is one of my favorite meals. Luckily, I made two pizza bases, so I have another one for this week! Sprouted buckwheat, zucchini and flax base with homemade raw marinara, topped with cashew cheese, red onion, red pepper, cherry tomato and fresh homegrown basil. Lastly, I FINALLY sourced some kale here in Madrid. Literally, years in the making 🙂 Before, I just made chard chips which are nice but as anyone who has had kale chips will tell you, just not the same! Well, I bought six bunches of kale for the sole purpose of kale chip making. Seriously, I need a bigger dehydrator. 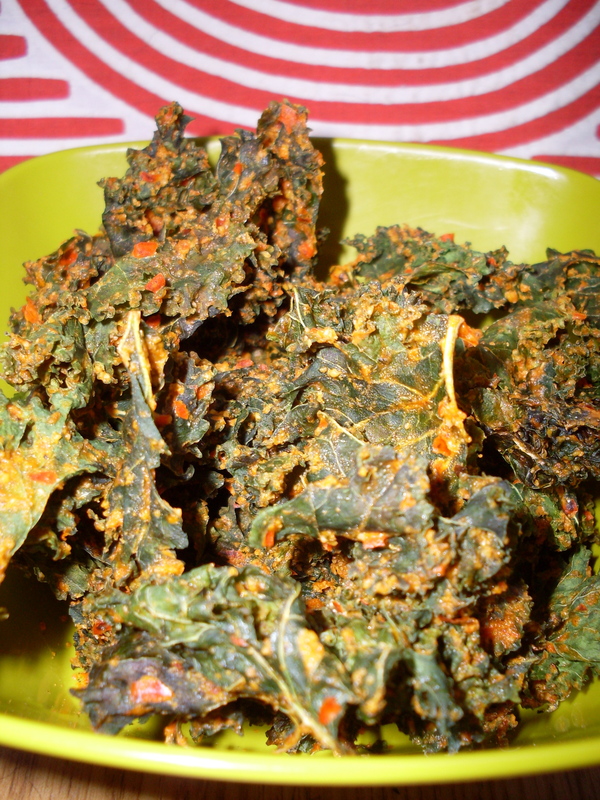 Here we go with some basic cheesy kale chips! That is it for now! 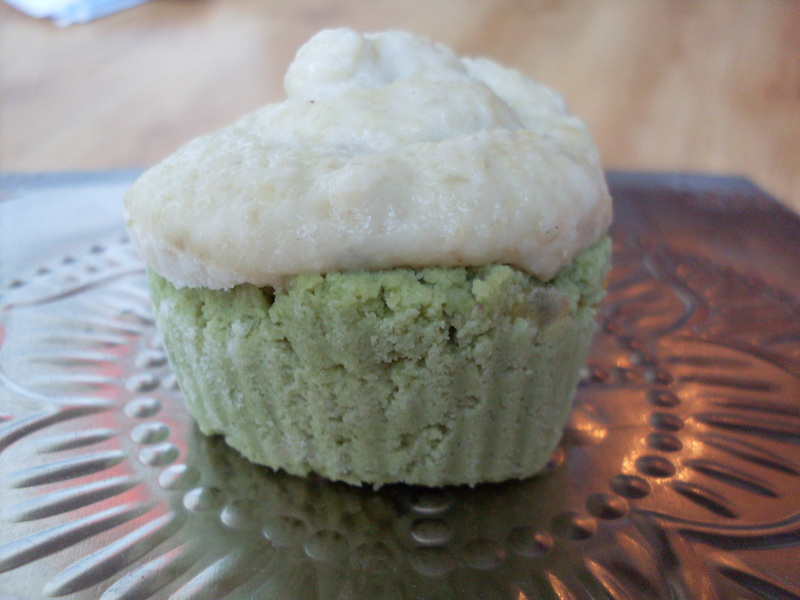 Stay tuned for my experiments with matcha green tea powder! Today is hot in Madrid, and I wanted something cool and refreshing. I also had a Galia melon that needed to be used. 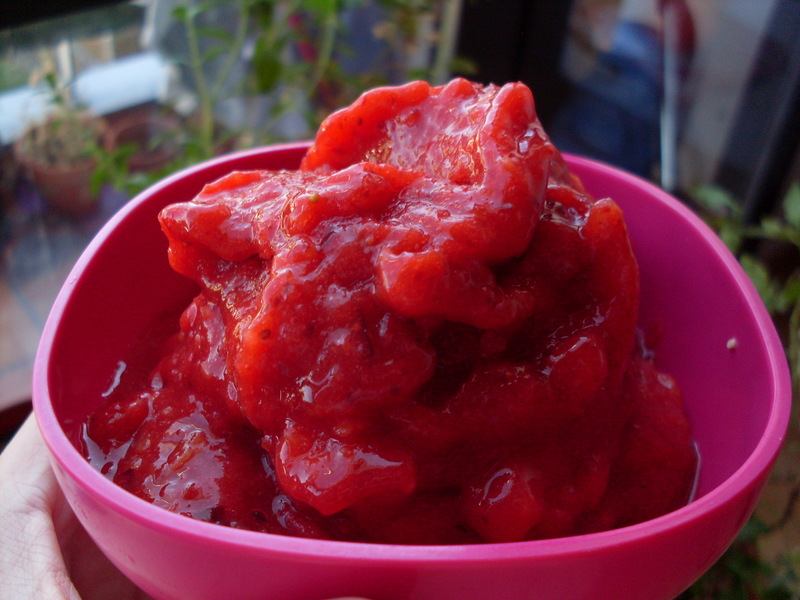 I started thinking about the canteloupe icees my mom used to make me when I was a kid and decided to do something similar. The result was super yum! * A Galia melon looks like a canteloupe on the outside but like a honeydew on the inside. The taste is more like a honeydew melon. Feel free to substitue either of these melons if you don’t have access to galia melons. Hoy en Madrid hace un calor tremendo y por eso me apetecía algo fresquito y refrescante. También, tenía un melón que necesitaba usar urgentemente. Empecé a pensar en los granizados de melón que mi madre solía hacer cuando yo era pequeña y decidí hacer algo parecido. ¡Batir y disfrutar! ¡Así de fácil! 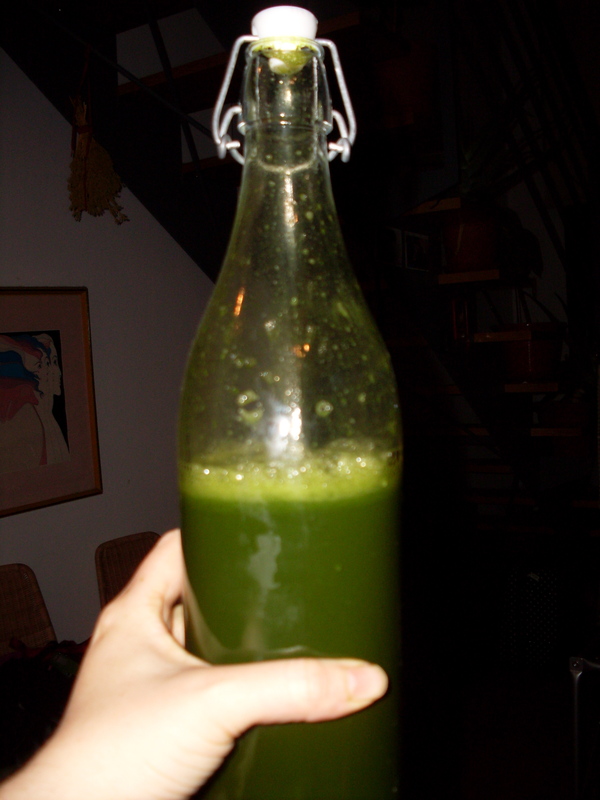 This juice was a super simple mix of wild foraged cleavers and nettles, apples and lemons. Oxygenating green lemonade!